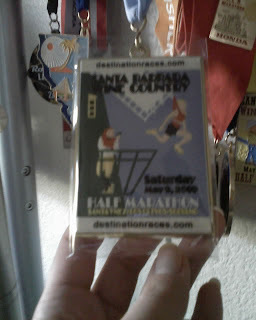 In spite of the fires in the Jesusita forests in Santa Barbara, "The Ukrainian" and I arrived in Buellton, CA on Friday, May 8 at a Marriott to pick up our race packets. This city of split pea soup was about 35 miles away from the fires. It wasn't until later that I found out that the town is not pronounced bulletin, bull-tin, or bowl-le-ton. At one of the two wine-tasting places we went to, we found out it is pronounced the way it looks: B-yule-tin (a-la Ferris Bueller). This race began in front of a saloon in Santa Ynez, CA. I woke up at 4:30 AM, walked over from my hotel in the small Danish town Solvang, took a shuttle, and had arrived an hour beforehand freezing outside until they opened the saloon. Most of the runners were doing the entire half-marathon, and once again, I was shirking and doing the half. The race started nearly 10 minutes late as the straggling runners on shuttles arrived. I was nervous because I knew that my relay partner, "The Ukrainian," was probably having some sort of ordeal getting to the transition point in Los Olivos. I also found it weird that this race does not play the national anthem at the start. I started off trying to hold back and not try to go under an 8:00/mi for the first mile because that would lead to disaster, from my experience. At the end of mile 1, we were greeted by a short tough hill. Basically, the 5.9 miles of the course I ran was a gradual uphill with some minor climbs (see diagram). The weather was mostly cool with some sun and occasional breeze, and we were running near wine fields and empty land in general. A few spectators were clustered in some areas, which was helpful. I was starting to tire out at around the 3-mile point, as I was still under 25 minutes at the time, which is pretty fast for me. The last mile seemed to be easier, but I was feeling nauseous, most likely from overexertion or the fact that I was wearing cropped pants and an entirely black outfit. Knowing that I was nearly done with my portion, I loosened my watch and did not expect to transition until I passed the mat, but "The Ukrainian" stopped me early and told me that people had told him to transition a few feet before the mat. So I unstrapped my timing anklet (for the relay people only... see picture) a bag from him with our room key, a cell phone, and towel, and gave him my watch as he had requested. If one had drawn a picture of this scene, it would have shown a girl kissing a puff of smoke, because he darted off to cross the mat and run his 7.2 miles of the race. Looking at the elevation profile (below), you can see that he had quite the hill to tackle. Meanwhile, happy that my part was over and that I had done it under 50 minutes, I went to the shuttle and was anxiously waiting to get back to the finish before he came in. We ended up getting there just in time for me to run from the shuttle to the finish. I claimed my medal and got another one for him as I saw him finish a race for the first time. I was able to give him his medal, but in his attempt to gradually slow down his heart rate, he sort of just grabbed it and walked over to the water area. We were greeted by a bunch of great food -- fresh baby carrots, grapes, bananas, oranges, and cut-up danishes, bread, muffins, and cheese. I limited myself to a few bites of muffin pieces and danish, and a few grapes with one half-slice of orange. We grabbed our t-shirts, walked over for a yogurt sample, and headed back to the hotel for clean-up, breakfast, and check-out. We ended up placing second in the co-ed relay category, behind the first team by a minute. I wish I had been able to run a minute faster, but I think I gave it a good effort and am not sure if I would have been able to run any harder than that. All in all, I am happy with my performance and impressed with my teammate's performance as well. It was a privilege for this slow me to be able to run a race with my speedy partner in crime. Good Luck!! Have a wonderful run and finish strong! Yay! So bummed I didn't get to run that race this year. My grandparents live on the route, right after the 2nd half.